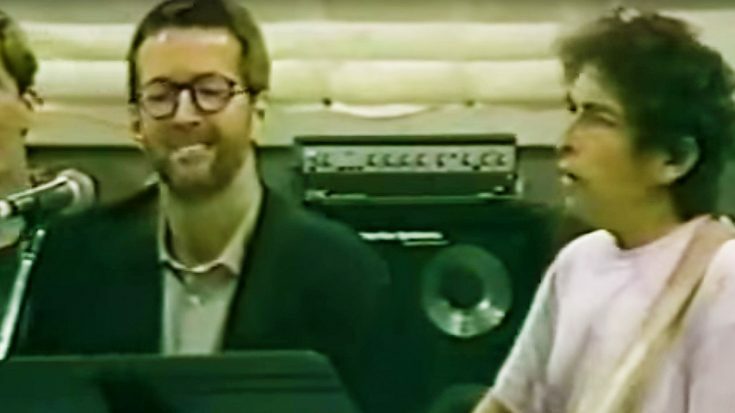 Rare Studio Footage Leaks Of Bob Dylan, Eric Clapton and Other Legends Rehearsing This All-Time Classic! Can it get any better than this!? Back in 1992, Bob Dylan celebrated his 30th anniversary of music making with a jam-packed all star concert. The lineup was littered with big name classic rock artists, and they all joined together for some pretty unforgettable performances. Before the big night, all of these legends packed into a rehearsal studio to practice the amazing performance. Luckily for us, footage has leaked from this rehearsal session, and it’s absolute gold! You can see legends like Neil Young, Tom Petty, George Harrison, Roger McGuinn and of course Eric Clapton and Neil Young. Prior to launching into the rehearsal for the song “My Back Pages,” you can hear and watch all of these legends interacting and mingling with each other. Fun Fact: The Byrds covered a version of this song in 1967. Already skilled at turning acoustic Dylan folk tunes into melodic, electric folk-rockers, the Byrds struck gold when they decided to take this somewhat nondescript Dylan tune from 1964 and electrify it for their fourth album. Leader Roger McGuinn cut out two of the more abstract verses and fashioned a chorus where there really wasn’t one, utilizing David Crosby’s harmony singing. Check out the amazing footage down below and let us know what you think!